The Malteser Cake is perfect if you’re after a treat that will knock everyone’s socks off. Not only does it look super-impressive, but it’s delish! It does come with a warning though – it’s not for the faint-hearted. This one is seriously sweet and chocolately; even for seasoned chocolate addicts, any more than a sliver might just have you jumping sky-scrapers. Pre-heat your oven to 160 degrees C. Grease and line 2 x 20cm round cake tins with baking paper. I actually doubled this recipe and made four. Because, you know – more impressive. This recipe works best if you have an electric mixer of some sort, or really big muscles. I used a mixer. Mix together the butter, caster sugar, flour and sour cream. Then add the eggs (one at a time), cocoa powder, baking powder and salt. Finally, add the vanilla. Divide the mixture evenly between your cake tins, smooth the tops with a spatula and cook for about 30 mins, or until a skewer stuck into the middle comes out clean. Let them cool for a couple of minutes before turning out (carefully!) onto a wire tray to cool completely. Mix together your icing sugar, butter and milk until they’re light and fluffy. Then add the chocolate and mix again. Smother each layer of cake with buttercream (again, I doubled this recipe) and squish gently together. Then cover the whole thing with even more chocolately buttercream, paying extra attention the edges of the cake. Once it’s totally covered, you’ll need about 600 to 700 grams of Maltesers. 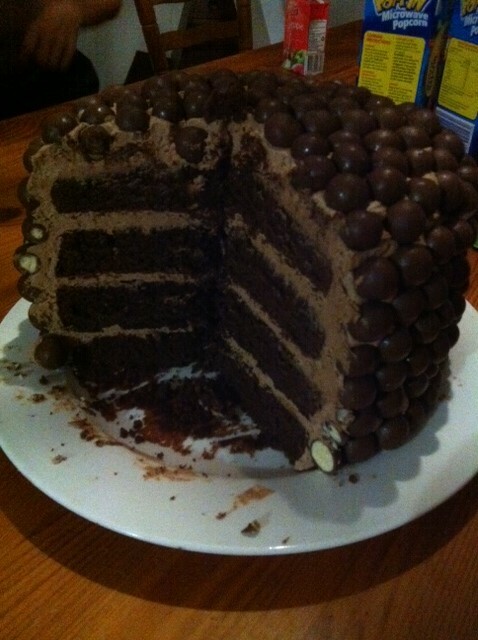 Start at the bottom of the cake, in the middle and place the Maltezers over the cake in a straight vertical line. Use that as a guide to covering the entire cake.